Ten Week Body Transformation- Have you �Had It� with your workout routine! You lose weight, but can never seem to keep it off? 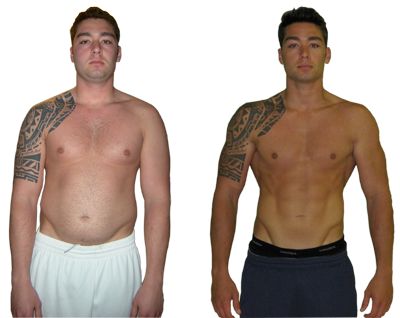 Our 10 Week Body Transformation Program consists of two� important elements. Meal Recommendations from Rob Knox- our Head Trainer at Navesink Fitness and Cathy Savage Fitness. Our Certified Trainers will raise your self confidence by helping you to boost your metabolism, build firmer muscle, and shed fatty deposits - no matter what your age.� After you have finished your 10-Week Body Transformation, you'll spend more time in front of the mirror with the knowledge that your 10 week gains can become lifetime gains.again. 10 Personal Training Sessions - Designed by Rob Knox to specifically meet YOUR Needs! Nutrition Consultations including food choices and real-life meal management that will help you keep the weight off for a life time! Please note that we can only make recommendations as we are not licensed nutritionists. Trainer�s Personal Email for ongoing nutrition and training support questions and recommendations. FULL Gym Membership and Access to ALL classes are included! The Body Transformation Challenge is a 10-Week contest based on total body transformation, with results based on inches lost, muscle tone gained, and over-all healthy appearance.� You don't have to participate in the contest but many do because it supplies come extra camaraderie and incentive. Prizes will be awarded for Women�s Champion, Men�s Champion, and The Overall Body Transformation Champion.